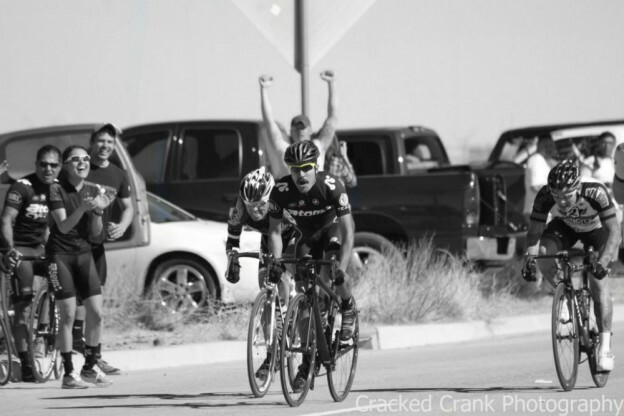 Trek El Paso | JOAQUIN’S SPRINT TO VICTORY! A group of about 30 Cat 5 riders came out on Sunday to compete in the 2nd race of the Winter Race Series hosted by EP Cyclists. With most criterium races, cornering is an added concern not only for the placement and acceleration but for the safety of the peleton. These shorter races also lead to a higher pace and a more assertive notion from riders who are looking for a win. Luckily, I stayed within the top 10 throughout the 35 minutes and made sure to bridge any gaps that opened up on the turn arounds. On the first 2 laps, riders went down when the peleton began to slow before each turn and fortunately none of them were injured suffering only minor scrapes. The pace through the next few laps alternated from 22-25 mph and on each incline a few riders tried to make a break however, the group was able to reel them back in before the turn. On the 2nd to last lap, I figured the lead group would try to attack and see if any sprinters would fall off the back. I was able to stay behind a few riders that I knew would be able to keep the pace and made sure I was able to position myself before the last lap. When we went around the cones signaling the last lap, the pace began to slow to about 23mph and we knew it would become a sprint finish. The course changed this year and the finish was at the top of a slight incline. As we got to the turn around at the halfway point I decided to go wide and end up on the outside of the peleton by the right curb. I had a feeling with the sprint coming up that the group would cut sharp from the outside of the lane to the apex of the corner, back to the outside of the lane which is the fastest route. While some took the corner cautiously, I pedaled through and stayed on the outside being able to move up to the top 5 before we got out of the corner. As we began to go up the incline I began to see a few riders from Juarez and Ghost, as well as EP Cyclists. Here’s to a great upcoming season for Team Atom Cyclist!